When you are sponsoring a family member to come to Canada, you are required to provide an Option C Printout of your last Notice of Assessment for the most recent taxation year. An Option C Printout is not a Notice of Assessment. An Option C Printout is a document that summarizes your income and deductions for a particular taxation year. It is usually referred to as Proof of income statement (Option ‘C’ Print). How to obtain an Option C Printout? If you think this information might be useful to others, please, click the Google Plus (G+) button at the beginning of this post. Call Canada Revenue Agency (CRA) at this number: 1 (800) 959-8281. Sometimes the number is busy; in which case try again a few minutes later until you get connected. Listen carefully and select the option that allows you to get the Option C Printout. Amount of Income you reported on Line 150 of your most recent taxation year. Make sure you have the information above otherwise the computer won’t be able to authenticate you. Once you finally enter the info, the automatic system (computer) will tell you that you have succeeded, in which case the Option C Printout will be mailed by postal mail to the address you have on record with the CRA. 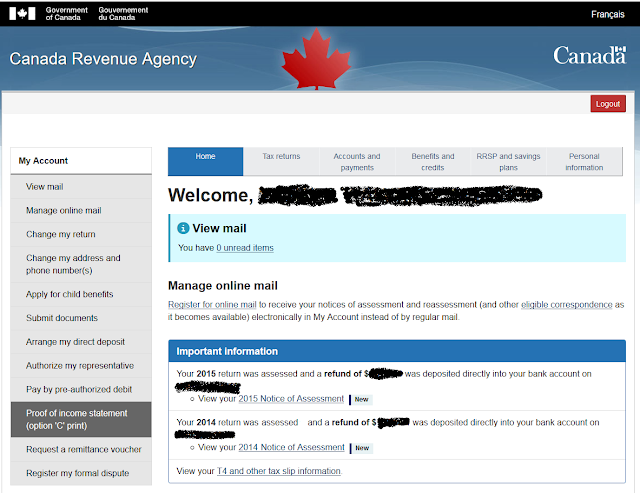 You need to register online with the My Account service of the CRA. Once you are registered with them, just login and look to the left where you will see the My Account menu. Click the option Proof of income statement (Option ‘C’ Print) which will allow you to print the required document. Below you can see a snapshot of how My Account looks like. I've tried calling dozens of times in the last few days, and it's always busy.. this is messed up. Sad to hear that guys. It worker for me nicely. That is not an option c printout. The application I'm currently working on states Notice Of Assessment or income tax summary will not be accepted. Isn't Option C different than the NOA? That's what I've read. I just submitted my request (following the instructions on this page), was wondering how long does it take to get one? Your notes are always a big help .Excellent ! Question! I am a Canadian citizen applying to sponsor my husband for Permanent Residence. We both live together in Botswana with our newborn son, who just got his Canadian passport. I haven't worked in Canada since 2014. I have my Notice of Assessment for 2014, but nothing beyond that because I've been working in Botswana. Do you think I need this Option C printout for 2014? As I said, I have the full Notice of Assessment. I'm just not sure that CRA will mail the documents to Botswana for me, and if they do, it will take ages and we would like to apply for PR ASAP! Sorry, I don’t know the answer to your question. I don’t even know if you can sponsor your husband without residing within Canada yourself. Do I need the Option C Printout if I am a Canadian living and working abroad? I am sponsoring my husband to come to Canada as a Permanent Resident, and we have both been living/working in Botswana since 2014. The most recent taxation year does not apply to me since I was not earning any income in Canada. Hello..I just to ask because I am applying for a Permanent Resident in Canada.. and what requirements they will need for the CRA, the notice of assement or option c print? Hi, My account is locked, how do I unlock it?